Archives of Eaton Bray News for June 2011. Skipper Norris was left dazed and confused and later to be found drowning his sorrows as on a damp track the firsts were skittled in dramatic fashion for 37 (yes 37!!). After Ellerton (2 for 7) and Barker (3 for 9) had run through the Olney batting line up, to dismiss them for 99, the Bray were confident of a win at tea. Keeping (5 for 9) and Smith (5 for 13) did all the damage after the break and seven ducks tells its own story! Highlights: Crazy game, toss lost on damp wicket and Olney bowled out for 99, 7th wicket stand of 60 between Bates (27) and Brown (31) getting Olney to 99. Ellerton (2-7) and Barker (3-9) doing damage. After tea Eaton Bray all out for 37 with only Hearn (12) reaching double figures. Keeping (5-9) and Smith (5-13) taking the wickets inside 20 overs! Another difficult day for the 2nds as having batted first on a two paced wicket they subsided to 117 all out from 41 overs. Several batsmen got in, with Gypps getting to 30 before getting caught and bowled and Smith 14 before holing out at fine leg, but aerial shots proved the undoing for others as Wilden held their catches. In reply the game reached quite a climax as Wilden having lost eight wickets limped over the line, in one of the overs gifted by the Bray. McCarthy with 3-19 proved the pick of the Bray bowlers, but in a tight game the bowlers giving up 12 wides and 7 no-balls between them, gave the oppo too much assistance. 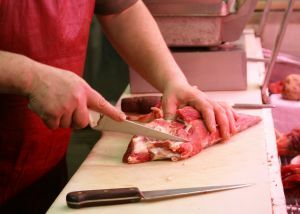 The butcher's shop in Eaton Bray is investing in new services and improvements. D&E Hines (High Street, Eaton Bray) are planning to open a new cookroom and bring on new products to go with their Derek Bunker handmade traditional pork sausages. The produce sold in the shop is bought from local farmers, including traditional mustards, preserves, free range eggs, oven-baked bread and fresh fruit and veg. D&E Hines makes their own cooked meats & ham, and also sell pies, cured bacon and traditional meats like corned beef. The shop has been in the same family hands for 15 years, and also gives advice on different cuts of meat and how to prepare it. Vegetarians won't be left out either and the shop is looking at making quiches and veggie pies. The Carnival Queen, Carnival Princess and Attendants have now been chosen for the main event on 2nd July! The four young ladies will lead the procession from the Orchards to the Green in a Bentley convertible. Follow the procession and cheer them on their way. The Carnival theme for this year is – "Pirates" – So come and join the procession representing anything associated with Pirates; Buried Treasure, Dastardly Deeds, The Skull and Cross-Bones or anything else that might push a happy reveller to the end of the plank .. let your imagination run wild !! Why not decorate your house as part of the Carnival Theme and brighten the route as the procession makes its way through the villages. Could you transform the outside of your house into a Caribbean galleon, will there be a plank out of your front bedroom, will Black Beard be adorning your front door, does the "X" mark the spot in the front garden where the buried treasure lies? For the less faint hearted (me hearties .. Haaa Haaa !) just how large a "Skull and Cross –Bones" can you fly from your chimney stack, I mean mast?! This year it looks like there will be a superb number of stalls on the Green, with more exciting entertainment and activities than ever before. Look out for the special techniques and contraptions used at the worm-charming event as contestants pour water, jump up and down, dance and play music into the ground to entice as many worms from the soil as they can in the allotted time. Listen out for the silent auction with the huge list of items to bid for. Watch out where you put your feet when Clarabelle the cow decides where to drop her special load which will provide a lucky person with a special cash prize. Be sure to buy your Clarabelle square on the Green; don't miss out or man'ure going to be sorry. There will be a wide range of tombolas and raffles for adults and children with instant prizes and non-stop fun. Make sure you get tickets for the Grand Draw too with extra special prizes! If it's breath taking thrills you are after be sure to try the giant bouncy castle and slide that will be on the Green on Carnival day. Are you a budding young artist? Be part of the massive picture that will be put together on the Green made from many individual paintings; all coming together on Carnival day. Don't miss the dog show! Whether you have a pooch or a pedigree the dog show is a don't miss event at the Carnival. This year wonder at the pooch and owner sausage eating competition; the canine that wins this is going to be a really "Hot Dog"! If your garden needs that final splash of colour or you wish to nurture something for summer salads you can pick up beautiful plants at the charity plant stall. Be entertained and amazed by the wood carving demonstration and perhaps you'll head home with a carving of your own. Whatever your taste buds might fancy there will be something for you at the Carnival. Homemade cakes, sponges and sandwiches of all kinds with a cold drink or a cup of freshly made tea from the Tea Tent. Perhaps you would prefer something hot from the barbeque with an ice cold soft drink! There will be something for everyone at the various food stalls. Be sure to visit the newly introduced Coq au vin Corner where a portion of France will be available providing the freshly prepared classics, Coq au vin and Boeuf Bourguignon, to tingle your cosmopolitan taste buds. Carnival 2011 will be a day out for the whole family to look forward to; free entry, free entertainment, and free parking. Various hot and cold foods and drinks will be available throughout the day on the Green, from the early hours until close down with non-stop entertainment. Make this a date in your diary! Can you provide prizes, of any sort, for the various raffles and tombola stalls. Can you assist with transport or provide the use of a lorry or van? Can you provide help with the early morning crew setting up tents and facilities on the Green? Egg and bacon rolls are served from about 7am!! Classic Cars - If you have a Classic Car you would like to show off for all our pleasure, contact Roger Wilkinson . The event relies on hundreds of people volunteering to help in various ways in the period from 6pm on Friday 1st July to 8pm on Saturday 2nd July. Please consider offering your services and if you can help please contact me. Many families have children who are participating in the Carnival Procession. If your child is joining a float please do not attempt to drive a vehicle into The Orchards. Instead, please park in Northall Road and walk to the Orchards via The Comp. We will arrange for the children's floats to be conveniently positioned so that the walk is not a long one. If your organisation / good cause could benefit from a donation from the Carnival Committee then please send a request via the Carnival website – www.stmarysvillagecarnival.com. Four members of the Carnival Committee will be standing down this year; they share around 50 years of experience in running the Carnival and will be greatly missed. However, this may be an opportunity for you. Do you have good organising skills that could be put to good use on behalf of our village community next year? If so please get in touch with me. I look forward to sharing another wonderful day with you all. See you at the Carnival. Moor End, Eaton Bray from its junction with High Street to county boundary. These temporary closures are required to facilitate the holding of the St Mary’s Village Carnival and Parade. The closure will be operative on Saturday 2 July 2011 between 10.00am and 3.00pm. Proceed on Bower Lane to roundabout with B489 Icknield Way. Take 3rd exit and continue on Icknield Way to roundabout with A4146 Leighton Road, Eddlesborough. Take 3rd exit and continue on Leighton Road to junction with Stanbridge Road, Billington. Turn right and continue on Stanbridge Road to junction with The Rye, Eaton Bray. Turn right and continue on The Rye to junction with Totternhoe Road and site and vice versa. The proposed Order will come into operation on 2 July 2011 for a period of one day. For further information please contact Heidi Head, Eaton Bray Parish Council; Tel/Fax: 01525 221464. 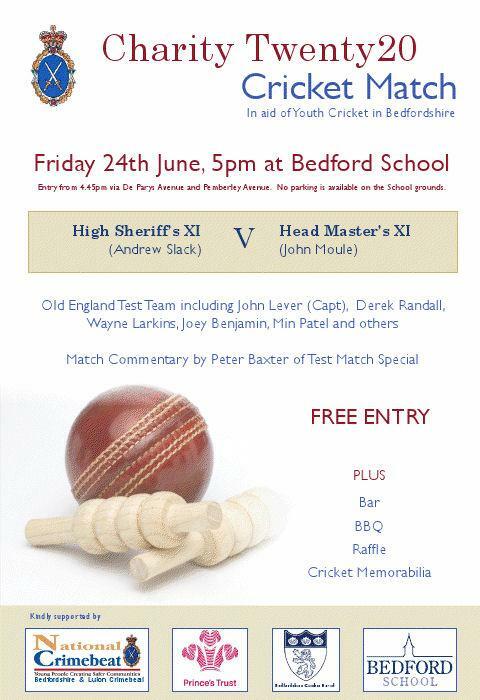 The High Sheriff of Bedfordshire, Andrew Slack, has organised a Twenty20 Cricket Match for Charity (Youth Cricket in Bedfordshire) to be held at Bedford School on Friday, 24 June: entry is free and there will be players from the Old England Test Team. For more, please see High Sheriff's Cricket Initiative. For further information please visit www.centraltogether.org.uk. The 1sts lost the toss and were put into bat on a good batting pitch at Biddenham CC. Openers Hosking and skipper Norris got off to an excellent start with a partnership of 128 before Hosking fell for 62. Another strong partnership moved Bray onto 190-2 when James Flecknell was bowled for a well played 32, skipper Norris made the first Bray century of the season, as 68 was put on for the fourth wicket partnership and he continued to strike regular boundaries until he was out for 130 chasing quick runs, which allowed Bray to declare with only 40 overs bowled on a mammoth 272-4. It was to prove too much for the home side, who as visits before show, soon after the beginning of their innings, batted for a bore draw despite the efforts of Bray's sharp fielding and bowling efforts of Pearson 1-24 from 8 overs, Flecknell 2-26 from 10 and 1-38 from Jarrett. Number 3 Godfrey batted for most of the innings, falling in the final over for 94, as Biddenham closed out on 203-6, giving the 1st XI 18 points for their efforts. Set 199 to win on a challenging wicket the Bray two's were hopeful of causing an upset against high flying Willen and after a comfortable start to the chase there was no hint of what was to come. A collapse from 14-0 to 15-5 in the space of four overs as S George wreaked havoc with the top order (finishing with 6-24), is the stuff of nightmares and is no doubt keeping long suffering Bray captain Kerins' (golden duck) awake at night! Only a resolute display from 'stonewall' Harris (54*) and Ian 'cat with 9 lives' Jones' (16*) secured the draw and it was pretty painful stuff as the final 22 overs were negotiated with the Bray finishing on 106-7. Earlier Willen had raced to 100-0 before the introduction of Kerins' (4-29 and two runouts) slowed the scoring rate down as he took regular wickets to have Willen 138-7, but a late order rally saw the game taken away from the Bray and the battle to stay in Div 3 looks set to be a long a hard fight. The Authority has just held its AGM, heralding the start of a challenging, and possibly the last, year for the Police Authority. This newsletter looks at the new appointments for the Authority, Police Performance and the way we are driving down crime, and the Police Reform and Social Responsibility Bill. At the Authority’s AGM, held on 20 May 2011, Peter Conniff was unanimously re-elected as Chair of the Authority. This will be Peter’s seventh year as Chair. Peter said that he was proud to be re-elected and that the coming twelve months promise to see new challenges on top of those with which everyone is well acquainted. Residents will therefore pay £144.77 per annum (which works out at 40p a day) in 2011-12 for a Band D property, which is the same rate as last year. Reflecting on the last twelve months, Mr Conniff acknowledged that the merger debate early in the year had had a clear impact on the Force’s focus and performance. “Once the ‘will we, won’t we’ merger debate was over, whatever your point of view on the merits or otherwise, we all moved on,” he said. Linda Hockey, another Independent Member, was re-elected for a second term as vice-chair. This role has special responsibility for partnership working which sees Linda in close contact with our statutory partners. She also is the Authority’s representative on the Local Strategic Partnership. Penny Fletcher (Independent Member) was appointed Chair of the Performance Scrutiny Committee and will also represent the Authority on the three local Community Safety Partnerships. John Williams (Independent Member) will be the Authority’s representative on the Safeguarding Children Boards. Following the local elections we welcome some new appointments to the Authority. Bedford Borough Councillor Colleen Atkins returns to the Authority after a two year break, while Doreen Gurney and Iain MacKilligan from Central Bedfordshire have been appointed for the first time. At the time of writing this newsletter, we are waiting for confirmation of the Luton Borough Councillor appointments. All Councillor appointments to the Authority are made by the Joint Appointments Committee and are not the responsibility of the Police Authority. We would also like to wish outgoing members, John Mingay, Alison Graham, Christina Turner and Lakbir Singh, well in the future and thank them for their contribution to the work of the Authority. By the end of the 2010-11 year the force had recorded a disappointing increase in overall recorded crime of 3.5% (1495 more crimes compared to the previous year). Members of the Authority agreed that the year had been a year of two halves, with the merger debate contributing to the downturn in police performance in the first six months. However, the noticeable up-swing seen over the last six months of the year has continued into the first month of the current year. To ensure the momentum is maintained, the Performance Scrutiny Committee has asked for a report on Serious Acquisitive Crime, looking at areas where crime has increased the most. We know that, across all three local authority areas in Bedfordshire, anti-social behaviour (ASB) continues to be a key concern for residents. When considering the Force’s performance the Police Authority was therefore particularly pleased to see a reduction in reported ASB incidents of 13% (over 5000) in 2010/11. All three authorities have identified tackling ASB as a priority area once again for the coming year, and our ambition is to improve on this performance and provide residents with positive outcomes and reassurance. We are grateful to the number of partners who have been involved with the Operation Vision days that have been taking place across the county, details of which can be found later on in this newsletter. It is also satisfying that criminals have learned the hard way that their ill-gotten gains can be taken away from them. Bedfordshire Police recovered nearly £1.5m in the last 12 months! A proportion of this is awarded to the force to help reduce crime. The AGM also saw members agree a formal three way Strategic Policing Alliance with Hertfordshire and Cambridgeshire, which will help all three forces to reduce the impact of the funding cuts on frontline policing services. All three Police Authorities have now signed up. This Alliance aims to provide savings £20M across the three areas, which is the equivalent of 400 police officers. When you consider the current financial climate when officer and staff numbers are being reduced, you can see just how significant this agreement is. The strategic alliance will reduce the impact of the cuts on the number of police officers providing visible local policing AND improve the effectiveness functions designed to prevent crime. Areas where we think the Alliance will provide most benefit include Finance, Human Resources, Information Technology, Contact Management, Criminal Justice, Firearms and Dogs. The aim is to design the most economic service delivery model for this type of activity across all three forces. The major changes in our structure, highlighted earlier in the year, are now being developed. Over the coming months we will arrange one-to-one meetings and Partner Practitioner Days to help us work through the detailed design of these changes with you. The new structure is likely to be fully operational by the beginning of October 2011 and these meetings will form part of our engagement and consultation between now and then. We plan to keep you fully informed of our progress and development after the partner practitioner sessions have helped us shape the final design. Look out for various consultation events over the next few months. Every possible effort will be made to make sure that partners, and more importantly still the public, are aware of any changes they can expect to the policing service they receive, especially if it affects the local policing teams. If you would like to know more about your local Neighbourhood Policing Team, please use the link below: www.bedfordshire.police.uk/neighbourhood_teams/. This work is helped tremendously by Operation Vision when police officers, PCSOs, cadets and support staff are all mobilised into an area. The aim is to talk to as many residents of a particular community as possible – by knocking on doors and asking questions about what the main concerns of the community are. Typically, around 1000 homes are visited in a day – and other activities such as enhanced patrols by Special Constables in the evening and targeted phone calls to previous victims of crime from volunteers working in the police control room also take place. One such day in Biggleswade recently saw over 750 homes and farms visited, when 248 people were spoken to about their issues and concerns, the majority of which focused on thefts involving outbuildings and metal. Around 50% of those contacted have signed up to the Ringmaster messaging service to enable them to receive alerts and information about crimes in their area. The day also saw three people arrested for crimes such as money laundering, drugs offences and burglary, while British Transport Police issued 32 fixed penalty notices for fare evasion. In the evening, a team of specials returned to the streets of Sandy to carry out patrols around anti-social behaviour. A number of partners have been involved in these operations to date, if any organisations would like to support future events please contact [email protected] in the first instance. Operation Vision will be featured in the Crimewatch Roadshow during the week commencing 20 June. This Bill has had a somewhat rocky ride over recent weeks. After more amendments than any previous Bill, it was finally presented to the House of Lords at the end of April. Firstly Lady Hamwee recommended that the concept of directly elected Police and Crime Commissioners was piloted instead of the proposed big bang approach. Then Nick Clegg, even though confirming that Commissioners are still on the cards, added that ‘how’ is open to discussion. Next, Baroness Neville Jones (the former minister of state responsible for security and counter-terrorism who has since resigned), ruled out pilots in her response to the Lords debate on 27 April. Then, in a surprise move, after two weeks of heated verbal ping pong Baroness Angela Harris put forward an amendment which won support by 188 votes to 176. The Baroness proposed that Police Commissioners should be appointed (not elected) by a police and crime panel, in much the same way that the Chairs of Police Authorities are selected. Baroness Harris said directly elected police and crime commissioners posed "great risks to policing" and raised doubts about who would have the power to hire and fire chief constables. "I am very concerned that the evidence base for making this change is incredibly thin and the consequences of implementing it have not been thoroughly researched or properly thought through," she said. Clearly, the Government will endeavour to overturn this decision when the Bill returns to the Commons later this year. However, with the Bill still to be debated clause be clause in the House of Lords, timescales for its return to the House of Commons are uncertain. What is clear though is that there is still a lot more work required on this Bill and more public debate needed. Meanwhile, we will have to wait and see what impact, if any, the Lords intervention will have. We will need to work with our partners to make the transition from Police Authorities to Police and Crime Commissioners and Police and Crime Panels successful. Once we have a clear picture of the implications of the national debate we will start working with you to make this work for Bedfordshire. The circulation of this newsletter is growing all the time and we try to ensure that it contains information of interest to you. If you have any comments, or specific information that you would like to see included please let us know. The 1st XI got back to winning ways with a 47 run win at home to Studham. Bray were inserted and at 48-4 were struggling, until a partnership of 113 between Josh Peacock (70) and skipper Andy Norris (35) got Bray going again. Jaco Jacobs (36no) hit some lusty blows to get the score up to 216. The visitors scored quickly at the start, but regular wickets began to take their toll. At drinks Studham were 109-5 with Chris Thorne (61) well set. The rye wicket played its part and wickets continued to fall, allowing Bray to ease to victory. The Bray Sunday Superstars travelled to the picturesque Hawridge and Cholesbury CC on Sunday, hoping to build on their good efforts from the previous week. Bray won the toss and fielded first, and good bowling efforts kept HCCC to 208-5, a very short boundary on one side meaning boundaries were easily scored throughout the innings. Good bowling performances from Joe Roff, 0-25 from 8 overs, Louis Peek, 2-18 from 5 overs and Ryan Peacock 2-19 from 4 overs. An excellent tea followed, (easily the best tasted, as told by Jacob) and then it was Bray's turn to bat. An opening stand of 44 from Peacock and Barker meant things got off to a good start before Jacob was out for 4. Enter Adam Harvey, with no cricket in him for over a year set about scoring quickly as another strong partnership (57 runs) was made between him and Peacock, until the latter was stumped on 59. Harv ended up with a Bray best of 33, and a few quick wickets followed, until numbers 6 and 7 Ryan and Matt put on 51 between them. Both batsmen fell in quick succession with 31 being needed off 3 overs as the scoring slowed somewhat. A few good late hits from Louis Peek took Bray to 185-8, just coming up short once again! Another very good performance from the young Bray lads, where only one player was over the age of 25. Central Bedfordshire Council is developing fresh thinking as it prepares for the launch of a new Music Service later this year. Government grant reductions have required the Council to reduce its costs by £19.2m during 2011/12. Redesigning the former Bedfordshire Music Service and operating it on a cost neutral basis is part of the Council’s response to its budget challenge. “We want to make sure that Central Bedfordshire children can continue to develop their musical potential so we’ve been consulting with young people, their parents and schools. "Following this we have reconfirmed our commitment to the four Music Centres in Ampthill, Biggleswade, Dunstable and Leighton Buzzard” said the new Executive Member for Children’s Services, Cllr Mark Versallion. Cllr Versallion also said “Originally we planned to reduce funding to the music centres and we expected that at least one of them would need to close. However, as a result of a further review of our overheads and back office costs, we’ve been able to extend funding to all four of the music centres in the short to medium term. This gives the Music Service time to work with its customers and potential partners to work up our new service programme before the national introduction of regional hubs in 2012. The Council has been allocated a reduced grant for music provision from national government of £394,000. With this it will introduce a new and more flexible model of music tuition. At the moment fees have been high from April but by working more efficiently, it is hoped that fees will reduce for parents as the year goes on and more young people access the service. Central Bedfordshire Music Service will be launched in July, supported by a newly designed marketing plan. There will be clear goals to put a greater focus on advertising existing and new activities and responding more flexibly to the identified needs of the young people and parents. As part of the service re-design a series of workshops are being held with schools, external partners in the business and the voluntary sector, pupils and parents to join Central Bedfordshire Council in developing plans for the future. “If we work together we can find ways of not only protecting these important services, but to develop them for the talented young musicians of current and future generations” added Cllr Versallion. For further information please contact: Tom Skinner on 0300 300 5738. Nine gardens will be open next Sunday (12 June 2011) to raise money for St Mary's Church. In addition, there will be an Art Exhibition (including work by Leigh Glover who is currently exhibiting in the National Portrait Gallery) and live music in the marquee. 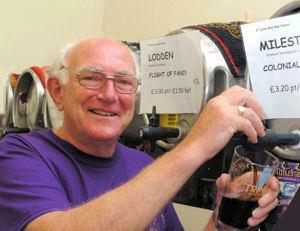 Do come and enjoy what has proved, in previous years to be a most enjoyable afternoon - Roving Tickets are £5. Any help that you can offer would be appreciated - helpers will have their own private tour of the gardens on 14th June. We would welcome donations of cakes/raffle prizes. Residents in Central Bedfordshire are being encouraged to take part in the ‘Big Library Debate’ which will look at shaping the Library Service, making sure it meets the needs of future generations and offers best value for money. Central Bedfordshire Libraries are at the heart of local communities and provide a gateway to information, learning and resources for all ages and the Council wants to ensure that the service is fit for the 21st century, making best use of modern technology and allowing easy access for all to benefit. Between the 1 June and 13 July, the 'Big Library Debate' display stands will be based at Libraries across Central Bedfordshire on the dates listed below and we would be delighted to see you there. We also want to hear from people who don’t use the library service so we will be out and about in town centres and the Let’s Talk Together meetings talking to local people too. Details of all activities will be available online from Wednesday 1 June. If you have any ideas of local community events we could attend or ways of promoting the 'Big Library Debate' then please let us know. Additionally, we will be holding some discussion groups to hear in more depth how service users and non users think the library service should be developed for the future. The feedback from these engagement activities will help inform the Library Service Review and options for the future model of the library service. Further consultation with the public, stakeholders and partners on these options will then begin in August. If you want to find out more about libraries in general or the Big Library Debate please email Kate McFarlane or Nicola Avery. The memory of a much-loved brother has inspiring Jamie Rawlings to overcome health problems for a charity challenge. 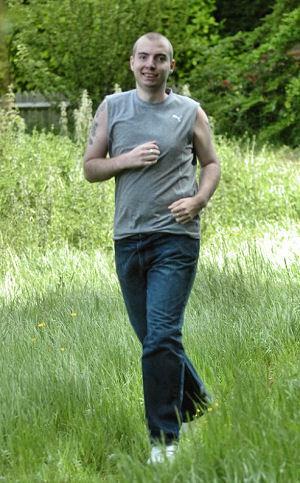 Jamie, 24, has epilepsy and slight cerebral palsy, and has set his heart on completing a nine-mile fundraising run. He would like to hear from big-hearted runners who could raise sponsorship and take part in his event. Jamie, who lives in High Street, will be holding the run from Eaton Bray, through central Dunstable, and then back to the village, on Saturday 23 July. The event is being organised in memory of his late brother John, who had epilepsy, to raise cash for the Epilepsy Society; John Rawlings was a familiar figure in the Dunstable area, who also contributed articles to the local Dunstable Gazette paper, about the history of pubs in the area. Jamie’s left side is affected by slight cerebral palsy and when he is tired this affects his pace, but he is determined to complete the course. The run is hoped to also boost awareness of epilepsy. “Even though people have epilepsy, it doesn’t stop them from getting on with their lives,” Jamie said. Family and friends will be taking part in the run, and Jamie is keen to stage future events for the charity too. 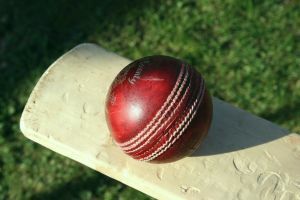 The Bray 2nd XI succumbed to a heavy defeat against high flying North Crawley on Saturday. Fielding first Crawley racked up 280-3 with a club record 169 from batsman Mitford and 71 from Goss being the stand out innings. Joe Roff was the only bowler to retrun figures of credibility with 2-34 off 8 overs. In reply, despite Ollie Wilson's defiant stand in attempting a draw, the only other players to hit double figures were skipper Kerins (19), former captain David Wheeler (10) as the home side took frequent wickets to leave Bray 69 all out. Bray travelled to Mk City hoping to improve on the heavy defeat that was suffered at the hands of Mk Village the week before. City batted first and some moments of brilliance were mixed in with some dropped catches and poor ground fielding allowing City to rack up 251-9 off of their 44 overs. Club stalwart Michael Jarrett bowled beautifully in returning figures of 3-30 and James Flecknell was amongst the wickets as per usual taking 3-50. In reply, despite skipper Wes Hosking's 44, MK took wickets frequently in dismissing Bray for 113, even with Joe Roff and Jarrett's defiant last wicket stand as a draw was attempted. The lads will be ever more desperate for a win this week, as they take on Studham at The Rye Garden's ground. The Bray 2's knocked up a modest 147-9 from their allotted 44 overs with the only notable contributions being 46 from opening bat Gypps, 18 from Ryan Peacock and 13 from vice skip Bob Warner. In reply The OU romped to victory within 35 overs with 70 from Basil Lall, and 23 from Parkin, although there were good efforts from bowlers Dave McCarthy 3-36, Nicko Pearson 0-5 from 6 overs. The 2's returned a lowly 3 points from the game and will hope to bounce back strongly against North Crawley this Saturday. Would you like to get more involved with reserve monitoring? In a new project started this year the Wildlife Trust is looking for local volunteers to help with monitoring and management at Cooper's Hill and Flitwick Moor nature reserves. Both these reserves lie along a geological feature known as the Greensand Ridge yet contain vastly different habitats. Cooper's Hill at Ampthill is a remaining pocket of lowland heath whilst Flitwick Moor is a valley mire next to the river Flit. This project, funded by the Heritage Lottery Fund, will involve increased habitat management at both sites and includes trialling different management options. Surveys of plants, animals and also reserve visitors will be carried out to ensure that the best management practices are being used. 'Totternhoe Quarry - Guided walk with John Comont'* :: Come and see the developments at the quarry. A 'field' follow-up to Graham Bellamy's March talk. Meet in the National Trust Car Park and Picnic Site at Totternhoe (2 miles west of Dunstable) - directions as follows: Head west out of Dunstable on the A505, across the A5 onto the B489 towards Tring. Turn right at the mini roundabout towards Totternhoe. After 1 mile, turn right in Totternhoe up track to National Trust car park. 'Flitton Moor wild flower walk with Chris Boon'* :: Now an annual event.- Chris will lead a short walk over the moor identifying the flowers and plants - at last year's walk over one hundred different species were spotted. Meet at the Old Shed on Flitton Moor, at the bottom of Brook Lane Flitton. The walks are open to all, but please reserve your place as space is limited. For additional information, or to reserve your place, please email [email protected] or ring Kathy on 07890 347327 after 6 pm or at weekends. If you wish to receive topical and lively e-news from our parent organisation, BCNP, please go to their website www.wildlifebcnp.org and click on "Get e-mail updates". Bray won the toss and put RR's into bat on an overcast afternoon at The Rye Gardens, which paid dividends as Ryan Peacock took the wicket of Rock for 6, in the 6th over, courtesy of an excellent catch by keeper Ringsell. RR's struck together a worthy partnership after that as opener Rymer knocked up 66 and Wiggins 56 until James 'Professor' Greene knocked back Rymer's middle stump. This sparked a middle order collapse as Greene, 2-15 off 4, J Peacock 2-18 off 6 and Kerins bowled well in recording 0-21 off 8 overs, helping restrict RR to 174-6. In reply the sunshine came out, things were steadily progressing, when JMC was caught in the 8th over. Peacock and Kerins came together and scored aggressively off the bowling, when Kerins was bowled for 33, Charlie Tickell came in at 5 and set about hurting fielders fingers, the chase was well and truly on. An excellent partnership of 78 followed until Charlie was out for a very well 35. Josh hit 55, but in a quick turn of events, was run out in a mix-up with Ryan who played his way to an aggressive 24 until being run out also, then Barm and Paul Davies were in and gone in a flash. It was left to the ever defensive Joe Roff and Pro. Greene to try and hit 3 runs off 3 balls as the match went to nail-biting mode. In typical fashion Roff blocked the first two and was bowled on the last ball, as the team looked on, gutted at how the wheels came off. A great effort in all 3 aspects, but it was just not to be. You are viewing the June 2011 archive.